The Eco-Drive Perpetual Calendar Chronograph Watch is a beautiful timepiece for those who want a watch that is both excellent in looks and in its abilities. The watch uses solar energy to charge its internal batteries, ensuring you always have a working watch whenever you require it. The Eco-Drive Perpetual Calendar Chronograph Watch has been created by Citizen, it is a solar powered watch with plenty of style. The watch has a sleek brown leather strap with white stitching and a buckle, helping it to be secure and comfortable on your wrist. The watch face is formed from a titanium case with a scratch resistant mineral crystal dial window. The watch boasts a number of features, it has a 1/20 second chronograph that measures up to 60 minutes, 12/24 time, dual time, an alarm, a date indicator, and an inner calendar, which automatically adjusts to the proper date as well as leap years through the year 2100. The watch additionally has independent hour hand adjustment, this allows you to be able to change between time zones simply and precisely, it is also water resistant to 200 m (660 f). The watch uses solar power to charge its internal battery, it can use artificial light sources when required but less efficiently. The watch only takes 4 hours to fully charge on a bright sunny day, 12 on a day that’s overcast, however by using an incandescent light source it will take 43 hours to achieve a full charge. The Eco-Drive Perpetual Calendar Chronograph Watch will operate from between 120 and 270 days from a single charge, due to its power saver function. The watch will warn you that it is on low power’ providing you with around 5 days notice, plenty of time to ensure it is exposed to some light. The man’s watch is an attractive timepiece that frees you from concerns over batteries running out, or from endlessly replacing them, perfect for those who need a watch they can rely on and for any eco conscious man. 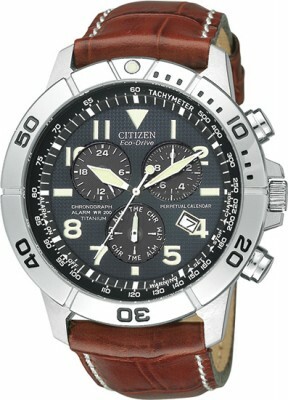 The Citizen BL5250-02L Eco-Drive Perpetual Calendar Chronograph Watch is currently priced at $240.00 and includes free shipping.